Construction has officially started on the "old Wendy's" building. It will become a new Starbucks, scheduled to open this Summer 2019. There will be a drive-thru as well as a Cafe, with outdoor seating. Check back here for more details! With easy access to education, transportation, economic opportunity, green spaces and other community amenities, this site aligns with the community’s priorities for bond-funded housing and ensures that future residents will have access to the resources and opportunities they need to thrive. 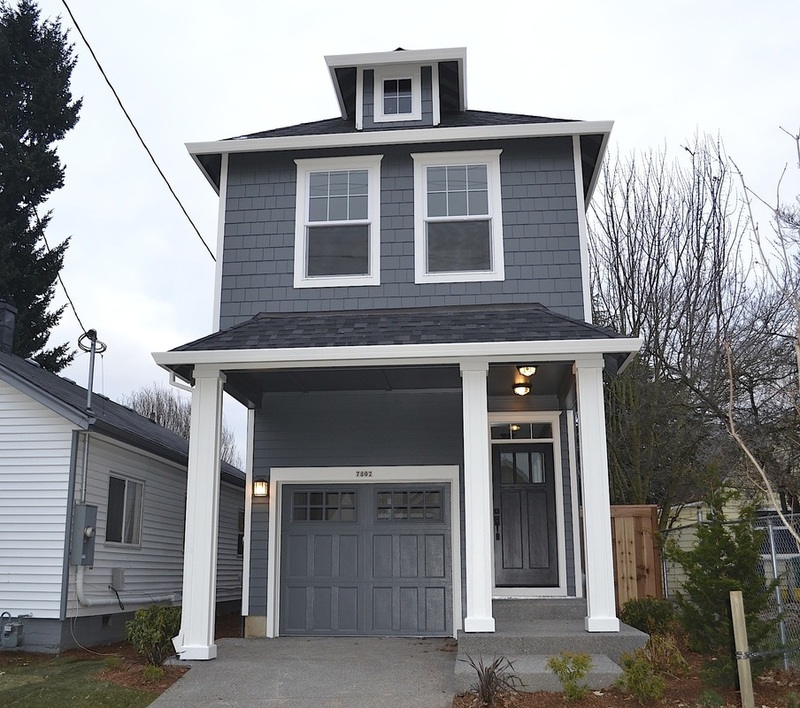 For more information about this project and the Portland Housing Bond, please visit: portlandhousingbond.com/. Jolene’s First Cousin is two two-story buildings on a single lot in the heart of the Creston-Kennilworth neighborhood. It will have a total of six units: three retail spaces, two market rate lofts and one containing 11 rooms in a single resident occupancy (SRO) arrangement. The 100-SF SRO rooms will share amenities: fully-outfitted kitchen, living and dining room, private landscaped courtyard, showers and toilets, and laundry facilities. Each room will have its own bed, closet, and sink. SRO renters will secure their spot in Jolene’s First Cousin for $425/mo. Half of the rooms will be put out to the general market on Craigslist. The other five will be filled with working houseless people in collaboration with our partner, Street Roots. The SRO residents will self-govern, establishing ground rules and operational systems. For more information, visit http://guerrilladev.co/projects#/jolenes-first-cousin/. The CKNA Land Use and Transportation committee met with Mark New of Development Company of the West (DevCoWest) on Monday, March 12, 2018 to discuss the property status. DevCoWest owns 50% interest in the property that until recently was the home of The Original Taco House and currently leases to numerous businesses including the Scottish Country Shop, Trillium Family Services, Rose City Strip, and others. The property owner requested the meeting with CKNA to discuss neighborhood security and safety concerns given the sudden closure of The Original Taco House (The lessors have ~2 years left on lease). DevCoWest has contracted with a Harbor Security to monitor the security of the property and has been responding to loitering and crime incidents on the property. When asked for future plans of development, DevCoWest stated that there was tentative plans to remodel the building that housed The Original Taco House and provide space potentially for a small neighborhood grocery. Given the lease arrangements on the property, this remodeling was not planned to occur until 2020. DevCoWest is currently brainstorming ideas for usage of the property in the interim. Suggestions were floated from the neighborhood such as making unused parking space available to a food cart pod (not unlike which recently closed down at 28th and Division) until the rest of the property is available for remodel or redevelopment. Important to note on the property is an existing City of Portland sewer easement that runs through the middle of the property and sweeps in front of the building which provides challenges to redevelopment. Also important to note is that current City of Portland building requirements for that property would mandate new residential units to accompany any redevelopment. Green Light Development will be presenting their plans for 3425 SE Gladstone Street at a meeting at 6:30pm Monday, September 18th, in their office located at 3050 SE Division Street, Suite 270. The property at 3425 SE Gladstone currently has 2 buildings, each with 4 apartment units, and no off-street parking. Green Light Development is proposing to demolish one of the existing buildings and add 20 new apartment units and 15 off-street parking spaces. The new apartments will be located in three separate buildings centered around a landscaped courtyard. They will be a combination of 3-bedroom townhouses and 1- and 2-bedroom apartments. Derek Metson of ​Greenbox Architecture (1300 John Adams Street Stuite 106, Oregon City) presented plans at the July 25th neighborhood association meeting for a subdivision at 3602 SE Francis St. The existing single family home at 3602 SE Francis St will be renovated and moved closer to the North side of the lot in order to add a second single family home on the South half of the lot. The existing house currently has a garage and an addition. However, both of these will be demolished before the house is renovated. Once renovated, the house will no longer have off-street parking. The new home planned for the South side of the lot will have a single-car garage. Designs for the new house had not been started as of the July 25th meeting, but the architect is willing to present plans to the neighborhood association when they are completed. This project will be built directly behind the Hopworks Urban Brewery, where the ABC Roofing warehouses used to stand. The planned apartments will include 50 parking spaces, on-site stormwater management through the landscaping, a bike shed with tools, garden plots for the residents, and a walking path around the entire property. Details were presented during the April 25th, 2016 neighborhood association meeting. The project is anticipated to be complete in 2018. Schematics and concept drawings can be seen on the Siteworks website. Aidan Willis with WDC Properties has applied for a building permit to build a 30-unit apartment building at 3714 SE Powell Blvd. 20% of the apartments will qualify as affordable housing, while 80% will be market-rate housing. While the permit application states that the building will be 5 stories, Aidan stated at the March 25th, 2016, neighborhood association meeting that the building will be only 3 stories tall. Rainier Pacific Development is proposing a mixed use building at the NW corner of Holgate and 52nd.There will be 3 store fronts on the ground floor, with 3 stories above for a 63-unit courtyard-style apartment building. There will be a small amount of parking provided for the commercial spaces, but no dedicated spaces for residents. Details were presented during the November 23rd, 2015 meeting. The Y Arts / SE YMCA Child Development Center at 6036 SE Foster Rd will be redeveloped to meet their current needs. The new child care building will be smaller than the existing building, and a 58-unit apartment building will be added toward the rear of the property. Parking and common spaces will be provided for the apartments. Concept drawings and elevations are available here. The project was discussed during the November 23rd, 2015 neighborhood association meeting. 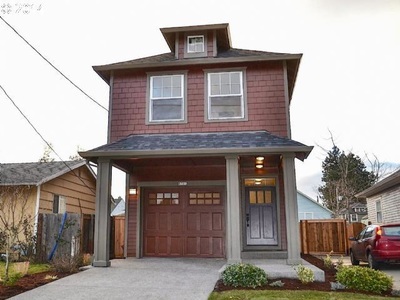 Vic Remmers of Everett Custom Homes presented plans for 8 free-standing houses to be built in the vacant lot on the corner of SE 36th Ave and Francis St. The homes will all face SE 36th Ave. Each home will have a single-car garage and driveway space for an additional car to park off-street. A similar style house was recently built by Everett Custom Homes at 4442 SE Rural. ​The proposed homes will be in the same style as those shown below.